As a dietary supplement, mix one scoop (12.1g) of EAA Max Energy in 10-12oz of cold water. Consume during exercise on training days, or throughout the day both training and non-training days. Feb 26, 2019 Primeval Labs EAA Max Energy Rainbow Sherbet Review: The Real Deal! EAA Max Energy is here! 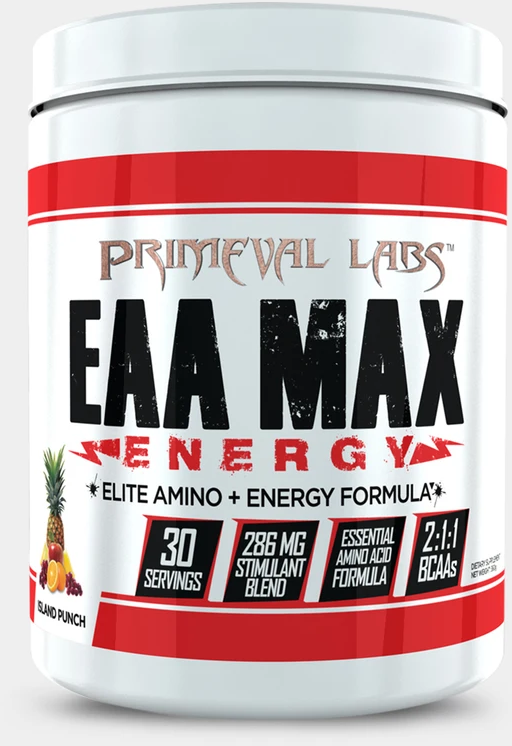 This is a caffeinated version of Primeval Labs EAA Max (see its PricePlow product page here) with what we believe is an even better flavor system! All in all, this one works out SUPER well - good energy blend with multiple sources of caffeine, and the flavors are on! Watch Tim Muriello explain the EAA Max Energy ingredients on our YouTube channel! Elite Amino + Energy Formula! Increases energy! Boosts muscle protein synthesis! Halts muscle protein breakdown! Supports Hydration & Enhances Muscle Growth & Repair! Elite Amino + Energy Formula! Increases energy! Boosts muscle protein synthesis! Halts muscle protein breakdown! Supports Hydration & Enhances Muscle Growth & Repair! 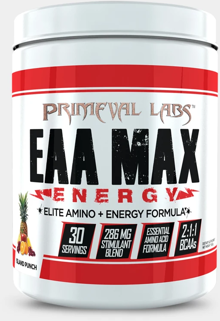 Primeval Labs re-defined the amino acid supplement category with the release of EAA Max. Not only were you getting a full spectrum of essential amino acids, you also got a full 5g serving of 2:1:1 BCAAs to support muscle growth, repair, and recovery. Now, the brand is about to effectively eliminate both the energy aminos and energy drink market with their newest release -- EAA Max Energy! What is EAA Max Energy? EAA Max Energy contains everything you've come to know and love about EAA Max along with a scientifically-formulated matrix of caffeine to provide long lasting energy throughout your day. EAA Max Energy is the replacement to your daily cup of coffee and your early morning or evening pre workout. Why spend upwards of $3 for some overpriced gas station energy drink that's just going to leave you feeling anxious or jittery? EAA Max Energy provides smoother, more prolonged energy along with the added benefit of all the essential amino acids to power your body's natural muscle-building abilities while you're on the go. EAA Max Energy makes an ideal pre workout on training days, or as a much needed mid day "pick me up" when you're stuck in endless business meetings. Toss a scoop in your favorite water jug and sip throughout the day for all day energy and muscle growth. No more overpriced trips to the coffee shop, no more nasty energy drinks, no more underdosed energy amino products. EAA Max Energy provides everything you could possibly want in one convenient, delicious, and affordable option! What is EAA Max Energy?What is EAA Max Energy? Encourages muscle growth and repair! Perfect for training and non-training days! What better way to lead off EAA Max Energy than with the energy portion of the product. Primeval Labs has developed the ideal energy-enhancing matrix utilizing three forms of caffeine for smooth, long-lasting energy. The precise combination of Infinergy Dicaffeine Malate, Caffeine Anhydrous, and Caffeine Citrate provide you with the immediate energy you need to get going and the long-lasting energy to sustain you throughout the day. EAA Max Energy avoids the common energy drink problem of making your feel jittery or leaving you feeling bottomed out a couple hours after taking it. The unique mixture of different caffeine forms provides an enjoyable energy "high" that lasts all day long with no crash, jitters, or anxiety. Leucine is the most popular, and researched, of all the amino acids. It's the "leader" of the three BCAAs, and acts as the main stimulator of the mechanistic target of rapamycin (mTOR) pathway. Once mTOR is triggered, it drives muscle protein synthesis (i.e. muscle growth) and with that comes greater cell growth, multiplication, and metabolism. Plus, leucine also helps ward off catabolism (i.e. muscle protein breakdown), which protects your gains during those periods when you're not able to eat a full meal. Usually referred to as Leucine's "little brother", Isoleucine is a more mild (i.e. "weaker") stimulator of mTOR in the body. Basically, it can trigger muscle protein synthesis, but not as effectively as Leucine. But, where Isoleucine does stand apart from its bigger, more well-known brother is in the area of glucose use in the body. Specifically, Isoleucine improves glucose utilization and uptake in the body, which is crucial to having superior performance in your workouts. Valine is the third and final member of the BCAA family. It's essential for glycogen synthesis and energy conversion in the body. Valine completes the BCAA trifecta needed for stimulation muscle protein synthesis and energy production. L-Lysine is an important role player in performance and muscle building. First, this essential amino acid is necessary for carnitine production. Carnitine is a substance that helps the body utilize for as a source of energy. Lysine also supports protein construction, injury recovery, and calcium absorption in addition to its role in skin, cartilage, and collagen synthesis. Threonine is an alpha amino acid needed for glycine and serine synthesis, two amino acids essential to protein synthesis in the body. Threonine also works with methionine (also included in EAA Max Energy) and aspartic acid to enhance fat digestion in the liver. Phenylalanine is an incredibly unique amino acid in that it can can cross the blood-brain barrier (BBB). As such, phenylalanine plays a key role in optimal CNS function, since it is involved in the production of three major neurotransmitters in dopamine, epinephrine (adrenaline), and norepinephrine (noradrenaline). These three primetime neurotransmitters govern how we view and interact with our surroundings, as well as serve to enhance energy, focus, and mood. As a precursor to serotonin production, L-Tryptophan plays a critical role in one's overall mood and behavior. Moreover, since L-Tryptophan impacts serotonin production, it also plays a role in cognition and optimal brain function. All of this is in addition to its role in protein synthesis. Histidine plays a key role in wakefulness as well as cognitive function. This EAA also functions as a precursor to histamine, which is essential for myelin sheath development and maintenance. Myelin sheaths cover nerve cells and support signal transduction from the brain to various parts of the body. Histidine is also required for adequate carnosine production. Remember, beta alanine? Histidine binds with beta alanine to form the powerful intracellular buffer carnosine, which prevents acid accumulation in muscle -- ultimately improving your endurance and performance. Lacking in either beta alanine or histidine essentially means your body's buffering capacity is limited meaning decreased athletic performance. Methionine serves many roles in the body, but one of its most notable roles is as a precursor to L-Cysteine, an extremely powerful antioxidant in the body. L-Cysteine combats oxidative stress from free radicals which preserves health and halts inflammation. Additionally, this essential amino acid also assists the liver in fat digestion (lipotropic function). Cluster Dextrin is a trademarked form of Highly Branched Cyclic Dextrin (HBCD), a rapid-digesting "functional" carbohydrate used by all manner of athletes. Cluster Dextrin has a high molecular weight and low osmolality, enabling it to pass through the stomach incredibly quickly, but without the bloating and GI upset of other functional carbs. Plus, Cluster Dextrin doesn't raise insulin or blood sugar levels, yet still improves energy, performance, and nutrient delivery. This is a key component to the power of EAA Max Energy. Cluster Dextrin provides the "shuttle" to maximize essential amino acid delivery to your working muscle, furthering muscle growth and recovery. D-Ribose is a supplemental form of Ribose, a sugar generated from glucose breakdown. Ribose teams up with Adenine to form adenosine triphosphate (ATP), the primary energy source of a cell. D-Ribose has been shown to enhance energy production, providing quicker recovery in between sets and superior performance in the gym and on the field. Increase Energy and Muscle Growth with EAA Max Energy! Primeval Labs has yet again set the standard for amino acid supplements. EAA Max Energy provides the energy you need to get the job done and fuel your muscle-building desires all at the same time. EAA Max Energy is the replacement for your daily coffee, energy drink, and amino acid supplement. Everything you want and need (energy, performance, muscle growth, recovery) is all contained in one convenient place. Say goodbye to bitter coffee and sickly sweet energy drinks and say hello to the delicious, energy-boosting, muscle-building EAA Max Energy! Increase Energy and Muscle Growth with EAA Max Energy!Increase Energy and Muscle Growth with EAA Max Energy! Island Punch This is a Buy 1 Get 1 FREE offer! Rainbow Sherbet This is a Buy 1 Get 1 FREE offer! Strawberry Passion Fruit This is a Buy 1 Get 1 FREE offer!